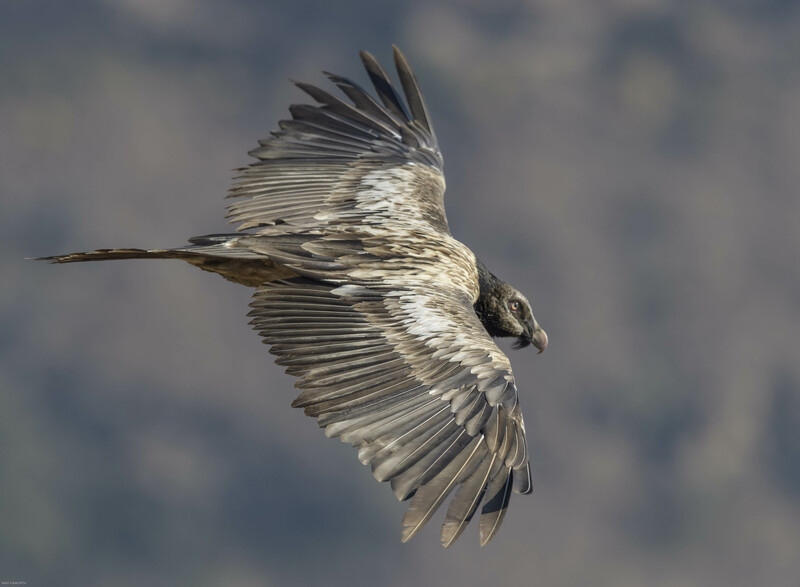 In mid July, Helen and I went up to Giant’s Castle for a few days with the idea of spending some time in the vulture’s hide, photographing all the avian comings and goings, especially the raptors and especially Bearded Vultures. The hide is popular so bookings over the weekend are hard to come by. As a result we took two days before the weekend and one day after to visit the hide. When in the hide it is a time to be quiet and watch. The Giant’s Castle Nature Reserve is in the Central Drakensberg region of the Ukhahlamba Drakensberg Park World Heritage Site in South Africa. Giant’s Castle camp is positioned on a shallow plateau overlooking deep valleys running down from the face of the High Drakensberg. The Bushman’s river flows in a shallow valley in front of the Giant’s Castle camp. One of the first things you will notice in the camp is the quietness. It is blissful. The only sound, other than birds and the odd baboon, is the sound of the Bushman’s river flowing over the rocks in the valley below. 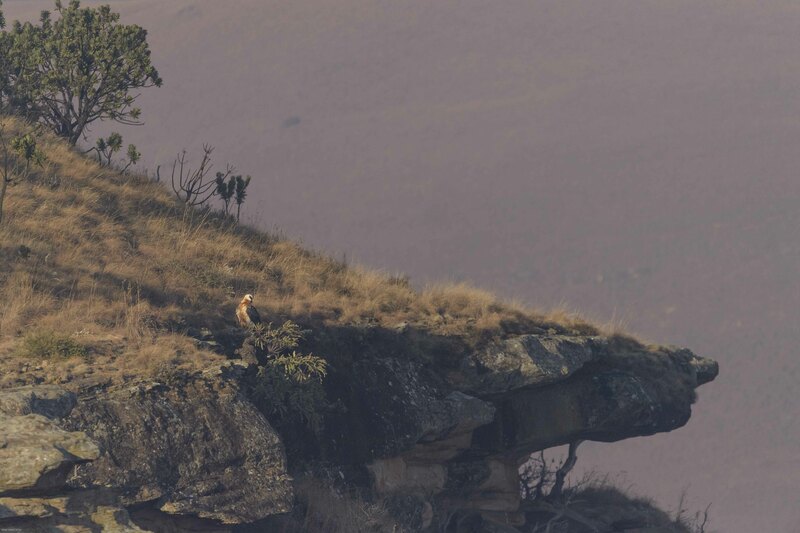 Being wildlife photographers and keen birders, the vulture’s hide being close to Giant’s Castle is a key attraction. 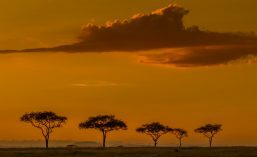 The vulture hide is isolated and affords quiet and beautiful vistas without human disruption. The idea is to get into the hide about 6h30 in winter about 30 to 40 minutes before sunrise. It is light at this time but the sun has not yet risen. It is often a time a sublime beauty with soft light. Then slowly unheralded, the sun begins to peer above the horizon and starts to paint the distant mountain peaks with mauves, pinks and apricots. It is a time of stillness, almost as if Mother Nature is holding her breath. It is windless and the air is crisp. One of the things I like about the hide is it is placed on a shelf in middle berg with a sharp cliff drop off to the valley about 800 metres below. This drop off provides an updraft for the birds around the hide. 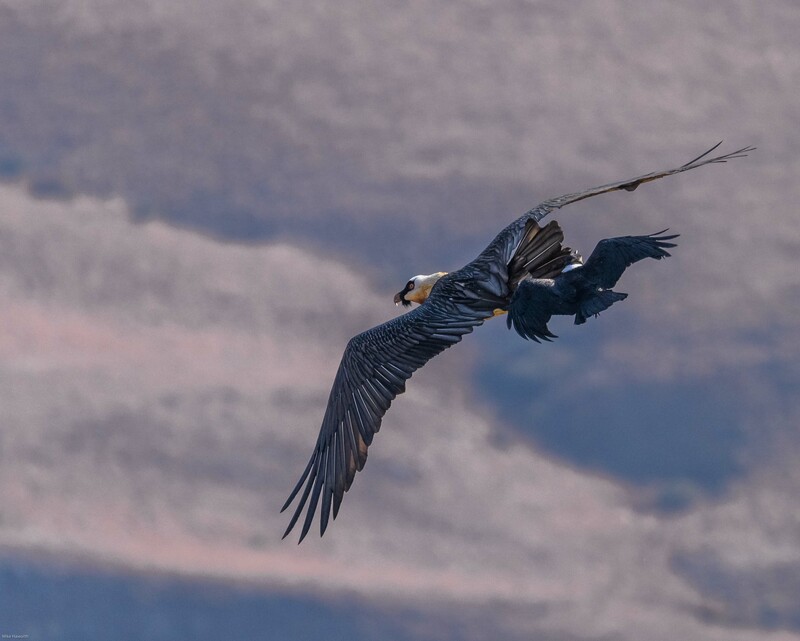 The larger birds use the updraft to glide up and down the valley and to play. For those who do not appreciate the nuances of the activity around the hide it can be very boring. It is quiet but active for those who look. The hide is conducive to being quiet, and looking and listening. The peace is soothing and the more you look and listen, the more you see and hear. For those who watch the natural stage in front of the hide nature begins to reveal herself. At times it is very quiet and at other times new players emerge and the drama can become intense. 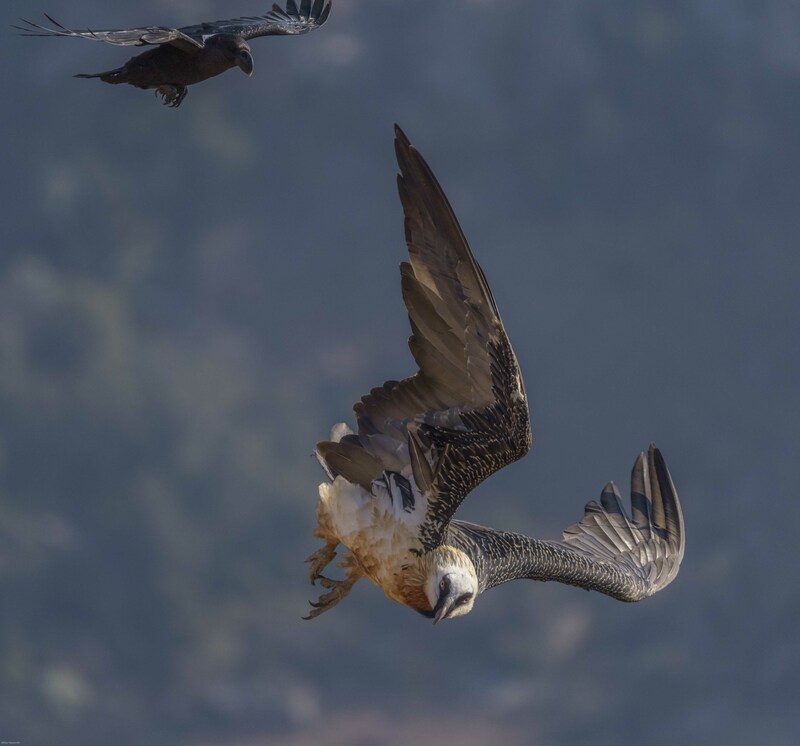 In the case of Bearded Vultures the drama is usually around landings or when the White-necked ravens start to harass the Bearded vultures. 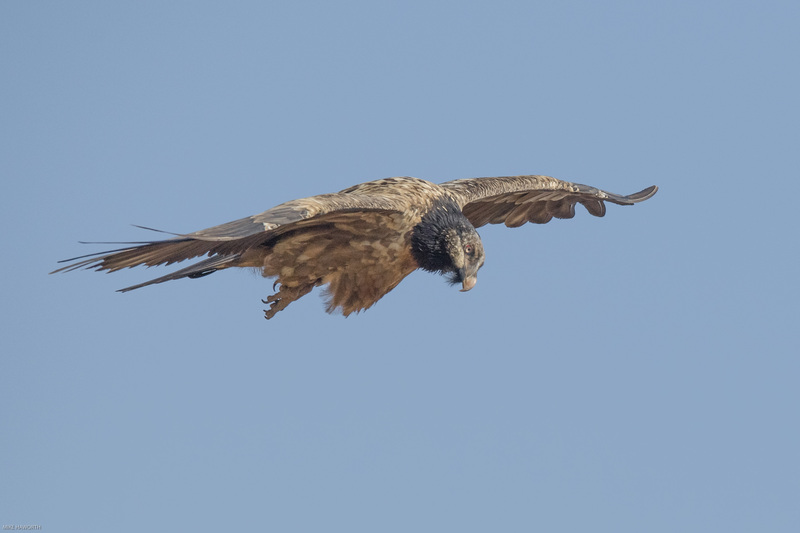 Both Bearded vultures and ravens are good fliers and capable of adept aerial maneuvring. At times nature follows patterns but not always. 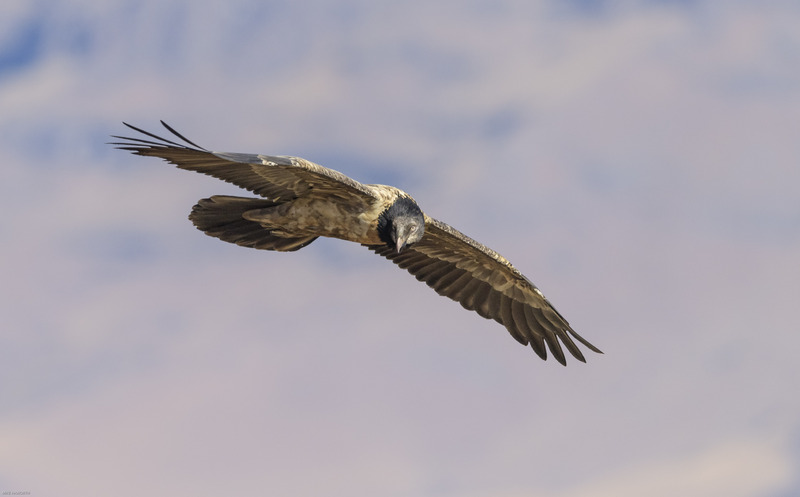 Often out of the blue the ravens will attack a Bearded vulture flying by. No one rings the bell to wake you up, you have to be ready with camera setting in place to get the shots when the action takes place. Often it is over in a few seconds. When it happens it is as exciting as any lion kill. From a photographic point of view this is an exciting time and difficult action to capture because it happens so fast. Time in the vulture hide is spent with long periods of little action, then all of sudden out of the blue something dramatic happens. Despite long period of nothingness, you cannot let your attention lapse for a few minutes as no bird announces its arrival. It flies into the photographic zone with not a sound. 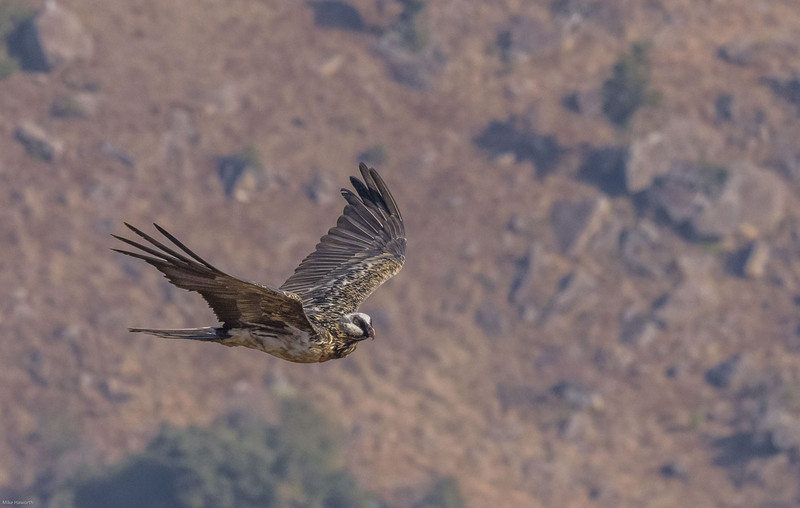 Watching this large bearded vulture glide past, ever watchful and aware, triggers something inside you. Its vast wing span and effortless riding the updrafts on the ridge shows a wonderful sense of freedom. 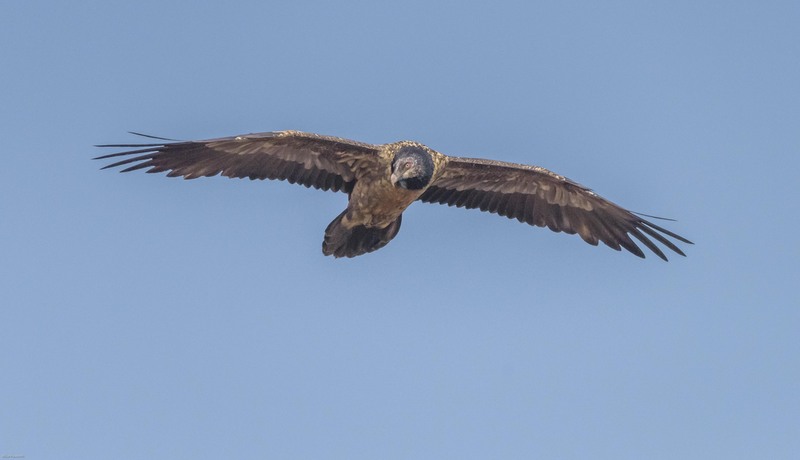 The juvenile Bearded vultures have black heads and they get progressively lighter and eventually get white feathers when they are mature. The aging of the juvenile is set in its face colouring and the development of its beard below its beak. Bearded vultures are able to swallow bones as large as 20 centimetres in length. These vultures are able to digest bone within 24 hours. It is not that they have unusual digestive tracts or break down the bones mechanically but rather it is the concentration of acid in their digestive system. Small bones are swallowed whole and larger ones are dropped repeatedly onto rock slabs, called ossaries, to break them into small enough fragments to be swallowed. Bone forms 70-90% of all their food intake. This vulture’s oesophagus is highly elastic and expands to allow the passage of large food items, but it has no clearly defined crop. The Bearded vulture is the only species of vulture to have this large storage region in front of the stomach. 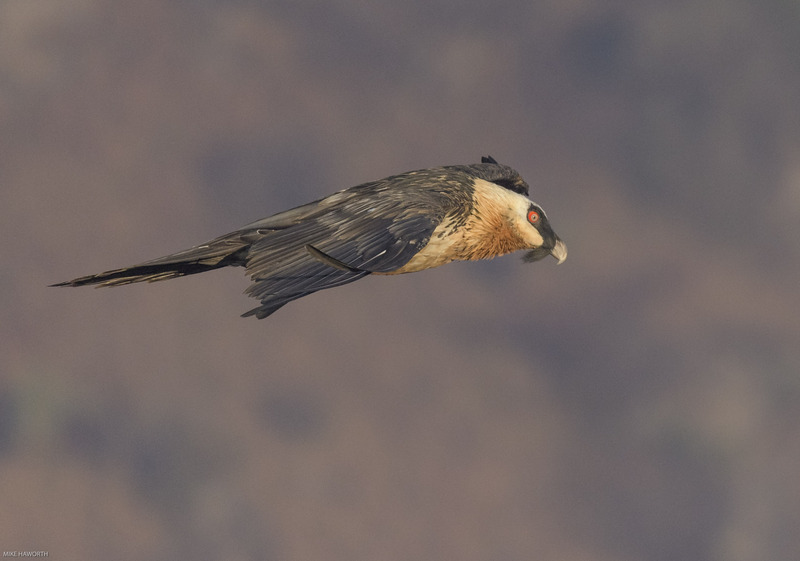 Bearded vultures use their oesophagus to store food. Source: Journal of Raptor Research June 1994 by David C Houston and Jamieson A Copsey. 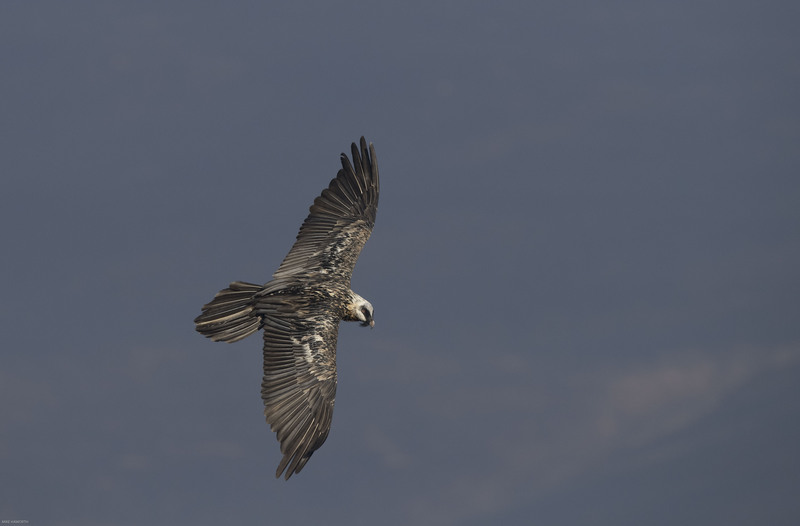 We were very fortunate to see a family of five bearded vultures, two adults and three youngsters flying by. The youngsters looked to be of different ages judging from their colouring. This was a juvenile probably three years old who was starting to get the adult colouring on its head but its body colouring was that of a juvenile. Judging from the colouring on its head this juvenile was probably around two years old. Its head was still black but its face was starting to lighten. The same juvenile from a different angle. 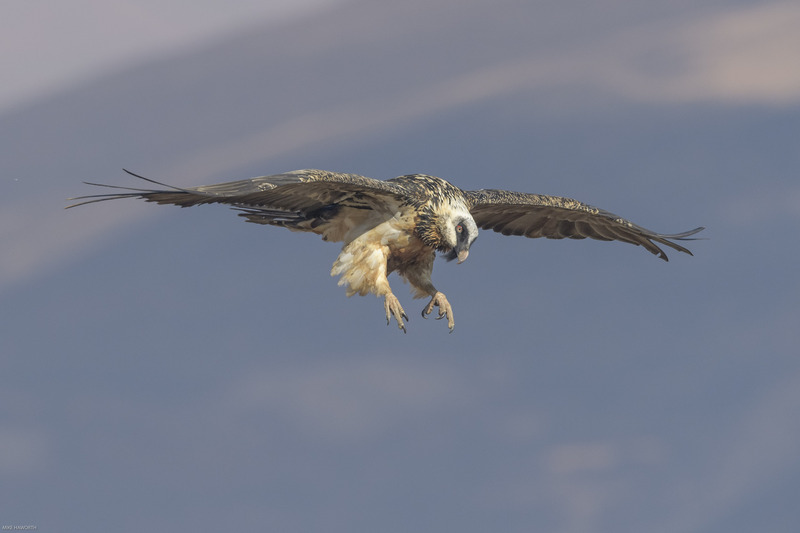 The sun rose in the east and the valley in which these Bearded vultures flew was on the west of the hide so the only way to get the glint in the eye was relatively early in the morning when the the sun was low enough. 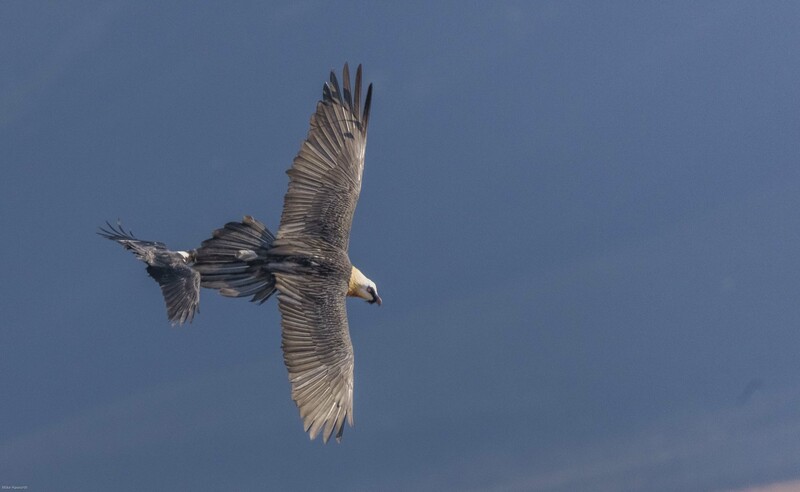 The adult bearded vultures have white feathers on their head and the feathers on their back and wings get almost black. The rust colouring on the white head feathers comes from dust bathing in iron rich soils and dust. The eyes are pale yellow, surrounded by conspicuous red eye-ring. The red ring is not just a marking around the eye, it is part of the eye itself. It is called the scleral ring. It’s red because it is actually full of blood, and it functions as the vultures’ threat displays. 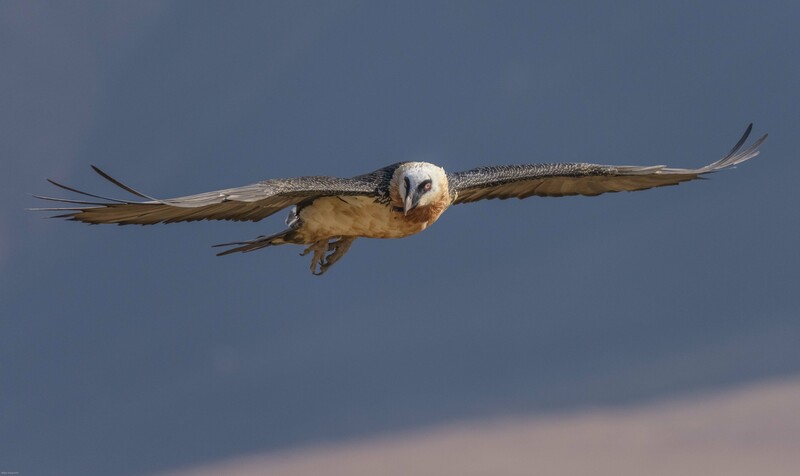 When a Bearded vulture is stressed or feels threatened, it will force more blood into the scleral ring, causing it to expand and turn more of the eye a red colour. 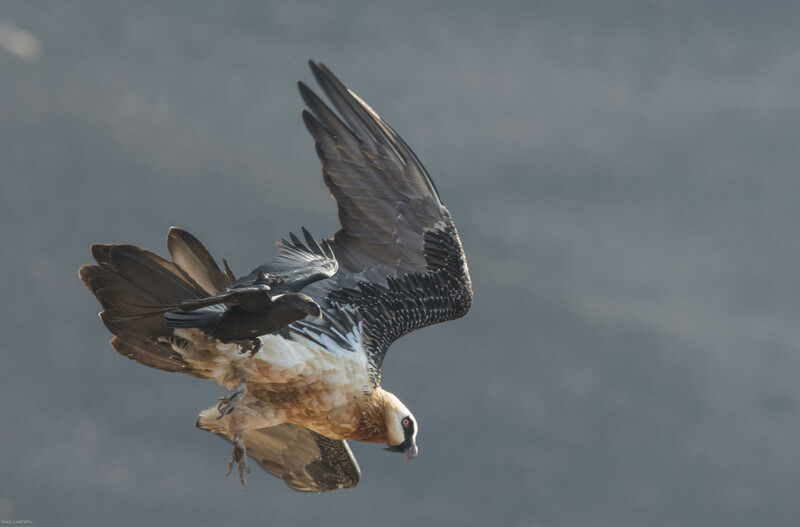 One of the highlights of any hide visit is when the bearded vultures come in to land in front of the hide. Alas, this seldom happens and it did not happen in the three days we were in the hide. 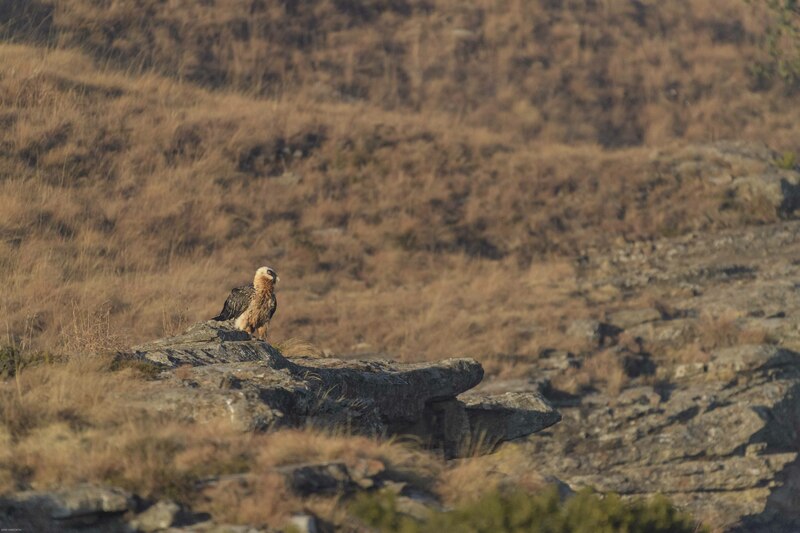 The area in front of the hide is the formal feeding station for these Bearded vultures because they are so endangered. There are estimated to be only 350 pairs in this region. Habitat loss is the key threat to these vultures as human habitation continues to encroach into their wild areas. Each morning before we travelled up to the hide we collected a bucket of bones from the camp office. The bucket of bones is part of the feeding scheme. The bones often have a lot of fat on them which the ravens, starlings and smaller birds seem to really enjoy. The jackals also take their fair share of the bones long before the Bearded vultures get to them. 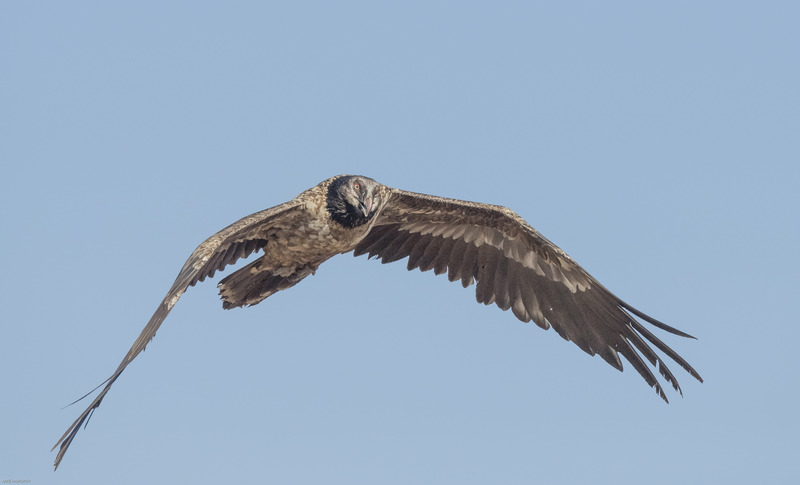 While I was putting the bones out in front of the hide, I peered over the ridge and saw two adult bearded vultures sitting on separate rocks about three hundred metres away. These raptors are very skittish and as soon as they saw me they flew away. 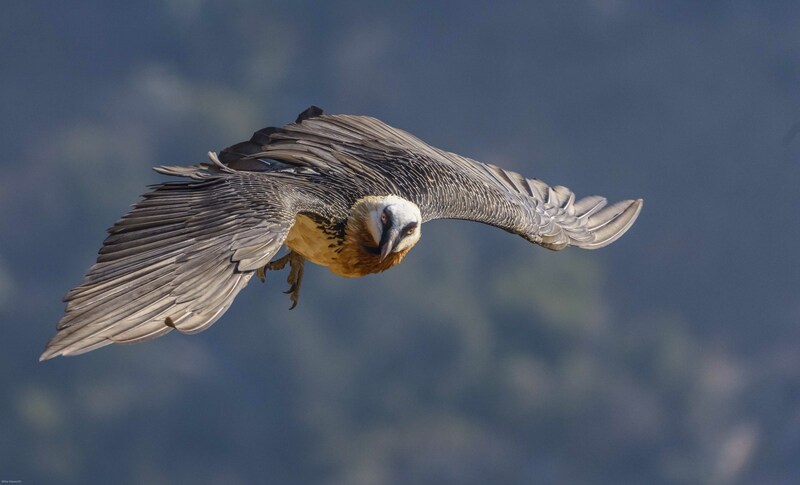 Despite their size, Bearded vultures appear to be timid by nature. They are regularly harassed by the White-necked ravens who are much smaller but act like terriers of the sky. It is only when you spend a long time in the hide do you appreciate that you are not the centre of the universe and that nature will reveal herself when she is ready. Watching these incredible raptors turn in the sky is a sight. 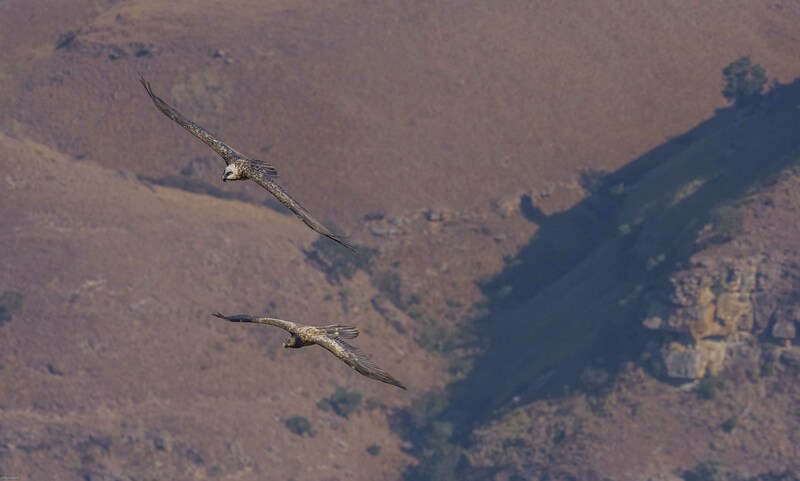 They have huge wing spans and seem to be able to effortlessly manoeuvre in the air currents along the ridge. They can cross the two kilometre wide valley adjacent to the hide in seconds. This adult Bearded vulture had its legs down after having just dropped a bone. Despite their large talons their feet are relatively weak and not as strong as the talons of eagles. 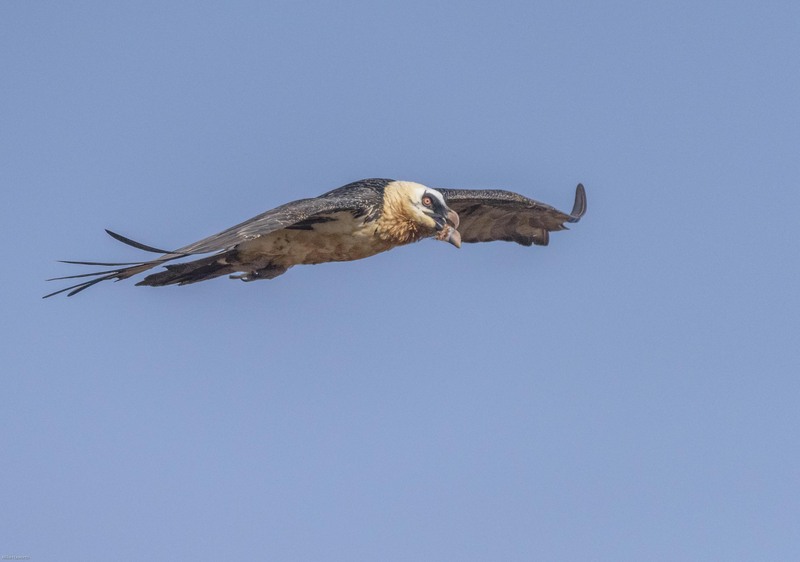 For a long period, these bearded vultures were persecuted on the presumption that they killed young sheep which is how they gone their name lammiergeir -a name is derived from the German word Lämmergeier, meaning lamb-vulture. When you have spent a couple of days in the hide you have a deeper appreciation not only for the vast beauty of the landscapes from that position but also the natural flow and rhythm along the ridge. To watch the raptors effortlessly use the updrafts to glide up and down the ridge and watch the ravens frolic in the wind gives us terrestrial beings a yearning for that kind of atmospheric freedom. The wildlife clearly knows this is a feeding station and takes full advantage of the resource. You have some lovely ‘captures’ here! What a fulfilling experience this must have been.